"Ain’t No Box Big Enough!" I have an interest in all things of the natural world. Besides fish, corals, and inverts, I study and have an interest in birds, insects, and pretty much anything that moves. I’ve worked on butterfly and dragonfly surveys; run bird surveys; and studied habitat ecology extensively. This can be useful when trying to create habitats in our fish or coral systems ... the more we understand ecosystems and their biology, the better job we do recreating them. 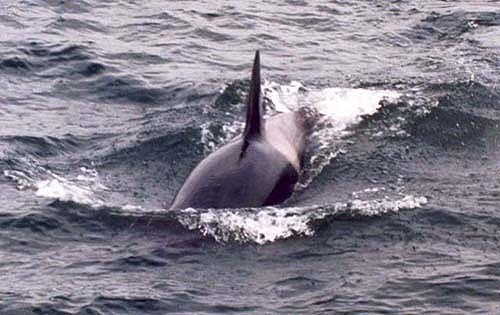 unlike Blue, which has a very tiny dorsal, the Fin’s is large. They are also the fastest of the large whales. I believe aquarists better understand the natural world around them by keeping fish or corals. Likewise, I think studying other animals makes you a better aquarist. These never ride your bow; they eat squid, have a bulbous head, and apparently fight alot (see the scars). 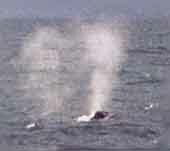 disappates to a short bushy blow, diagnostic of Humpback Whales. Also note the humped back where the dorsal sits. You only see a quarter (20’ of 80’) of the animal! One of my areas of research has been the sea. Be it birds, fish, or marine mammals, I love going asea to look for, watch and study them. And of course to study which fish taste best! For over a decade I have been a naturalist leader for the Los Angeles Audubon Society on their pelagic (means "of the sea") tours. That is, I’m the nerd on the microphone boring you to tears with facts about the birds you are seeing. I’ve spent thousands of hours asea looking for and studying these amazing animals, from Albatross to Orca, and Albacore to Blue Whales. I want to share some pictures with you that I got lucky on of some of these amazing animals, for which there "Ain't no box big enough!" You couldn’t afford the freight on them anyway. And forget the food bill too! Orca are incredible animals to see in the wild. out at sea, it is another world, their world. 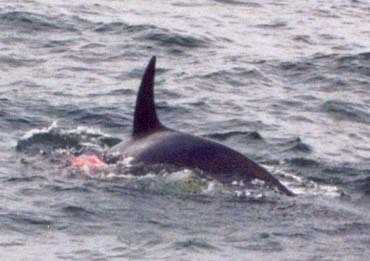 Note that Orca have no red on them. 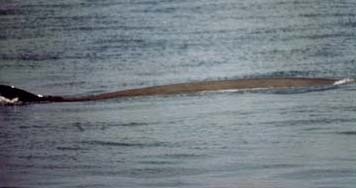 of what is probably a Sea Lion (a large seal). If you find yourself lost and in Los Angeles, CA, there are great opportunities to see these things. The Condor Express (a high speed catamaran) in Santa Barbara (two hours north) runs trips for whales all year. From June to Sept. you will almost certainly see Blue Whales ... sometimes dozens in a day! Humpbacks are there from May to September, and most summer trips see Blues and "Humpies." The Gray Whale is the one here in winter, from late December to March. There are cheap ($20+-) trips for them out of every port and harbor on the SoCal coast in winter. Laysan Albatross - with a 7’ wingspan! They can fly all day at 20-40 mph without flapping. regularly 50-100 miles off SoCal. Longliner fishing vessels kill thousands a year. 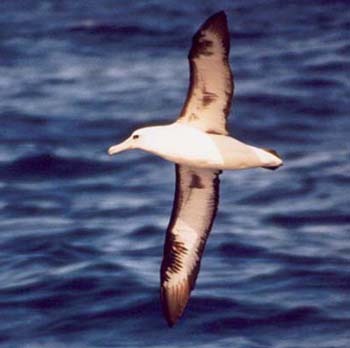 To actually see an Albatross flying in person (one man said life would never be the same! ), an 80’ Blue Whale up close, or a pod of Orca is an experience you will never forget. Seawatching fortunately has become so popular for even less interested tourists, that most coastal areas now offer some sort of whale watching at least part of the year. I can't urge you enough to go take one of these trips! I’ve seen 12’ Thresher Sharks chasing Tuna out of the water and 7’, 1500 lb. Ocean Sunfish (Mola). Giant Sea Turtles, pelagic (oceanic) crabs, Whales taking hundreds of pounds of krill in a single gulp, & 3’ Jellyfish (jellies properly). So on your next visit to a coast, check it out! as is the angled short (half a "V") blow. I hope you've enjoyed the pictures here and the "virtual" tour of the offshore SoCal waters. We do and hope you would consider supporting organizations that support study and research, or conservation, preservation and protection of the fragile oceans.